Today Mayor Joe Hogsett joined the Indy Hunger Network and partnering organizations across Indiana to announce the statewide expansion of Food Drop, a large-scale food rescue initiative. Nine hunger relief agencies are collaborating on Food Drop to redirect rejected truckloads of food away from landfills and into the hands of people in need. John Whittaker, Executive Director of Midwest Food Bank, kicks off the expansion of Food Drop. Every day, about a million trucks drive through Indiana, many carrying perishable food items. That food is often rejected at its destination, because it arrives on the wrong day, is the wrong size or color, or doesn’t meet standards for another reason. 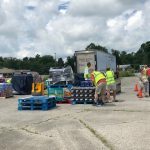 While still edible, this food frequently ends up in the landfill, as the driver has to offload the Food Drop expands to rescue rejected truckloads of food statewide in order to make their next pick-up. Food Drop is changing that by making donation the easiest and cheapest option for dealing with rejected loads. FoodDropIn.org accurately and quickly provides drivers with information on the nearest agency to receive their load, day or night. Instead of paying fees to dispose of food, drivers can expect help unloading their trucks, tax-deductible receipts, and the reward of knowing their donations are feeding hungry families. Representatives from Hoosier Hills Food Bank, Gleaners Food Bank, and Second Harvest Food Bank attended the event. In the 2017 Indianapolis-based pilot project, participating hunger relief agencies received over 86,000 pounds of fresh produce, valued at more than $146,000. 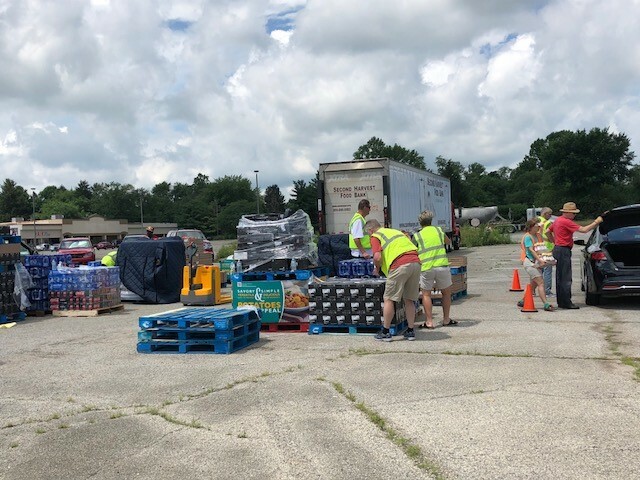 Now that the initiative has expanded, food banks in Muncie, Lafayette, Bloomington, Evansville, Fort Wayne, and Indianapolis are ready to accept loads, and all donated food will be distributed to hungry residents through local food pantries. As the Farm Bill deliberations move to conference in the next few weeks, Feeding Indiana’s Hungry commends the Senate’s adoption of additional funding for The Emergency Food Assistance Program (TEFAP), thanks to the leadership of Chairman Pat Roberts, Ranking Member Debbie Stabenow, and Senator Joe Donnelly. Our member food banks depend on TEFAP to address the significant need for food assistance in communities, nationwide. We will continue to work with representatives from both the House and Senate, as the legislation moves to conference, to strengthen SNAP and TEFAP. 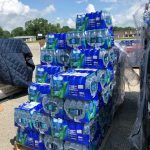 The Hoosier Beverage Association has donated bottled water and low-calorie and no-calorie flavored water to Feeding Indiana’s Hungry. 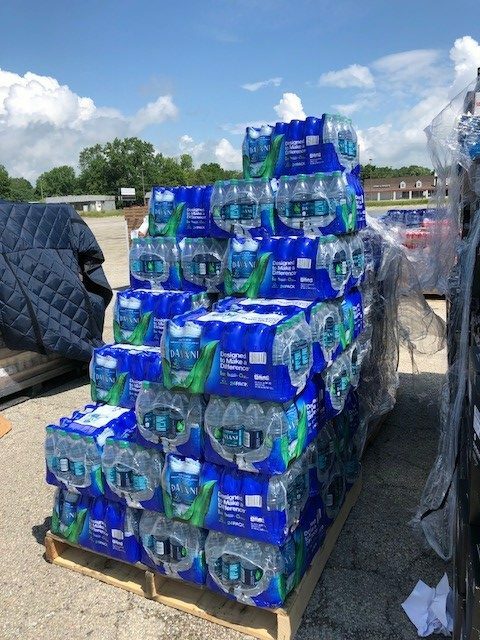 The water, along with other food, were distributed at the Second Harvest Food Bank of East Central Indiana tailgate in the former Kmart Parking Lot in Anderson today. INDIANAPOLIS – Possible changes to the Supplemental Nutrition Assistance Program (SNAP) now under debate in Congress could overwhelm the faith groups that run some of Indiana’s hunger fighting programs. Green says that requirement doesn’t match what his staff sees in the folks who come to the center. The Senate Agriculture Committee has just released a version of the Farm Bill, which includes the SNAP reauthorization. It doesn’t include many of the more restrictive provisions found in the House version. INDIANAPOLIS – Changes to the Supplemental Nutrition Assistance Program (SNAP) now under debate in Congress could trigger what observers and a new report say is an explosion of red tape and bureaucracy for Indiana. Rules added to SNAP, formerly food stamps, could include much tighter income and work requirements. Case workers would go from checking work and income a few times a year to every month. “That would be a devastating task to even have to implement, being able to have enough eligibility specialists and case workers to even process those applications in a timely manner,” she points out. The report from Washington think tank the Center on Budget Policy and Priorities finds states totally unprepared to handle the proposed changes. Supporters argue the tighter rules would save the government money by forcing people to get jobs. Thomas says that wouldn’t work. And most, if not all, of any savings would be eaten up by added bureaucracy. According to the center, four-fifths of adults on SNAP who can work already are employed or between jobs. A pilot project in West Virginia that imposed new work requirements found it didn’t push more people into the work force it only increased demand at food banks. And Thomas says Indiana’s feeding programs are barely able to provide anything like a balanced diet as it is. Under the House bill, every unemployed applicant would be referred to work training. But the center’s report finds those state programs would have to go from serving about a quarter million people a month to more than 3 million. It found the states unprepared for that, as well. The farm bill, including the changes to SNAP, could be up for a vote in the House toward the end of June. About a third of Hoosiers are often at risk of going hungry, but they aren’t eligible for federal food assistance. According to the latest Map the Meal Gap report, 31 percent of state residents who are food insecure can’t qualify for the Supplemental Nutrition Assistance Program (SNAP). Emily Weikert Bryant, executive director of the advocacy group Feeding Indiana’s Hungry, says what that means is those Indiana residents have to turn to food banks, churches and civic organizations in order to get enough to eat. Congress is currently debating the 2018 Farm Bill and lawmakers could put more restrictions on who is eligible for SNAP. Weikert Bryant worries how the changes she characterizes as taking an ax to SNAP will impact the state’s children, seniors and veterans who rely on it. “For every one meal that a Feeding America affiliate distributes, and there are 200 Feeding America food banks across the country, there are 12 SNAP meals that are plugging in the gaps in that family’s food budget,” she states. Overall food insecurity in Indiana ranges from a low of about 9 percent of the population in Hamilton County to more than 18 percent in Marion County. The statewide average food insecurity rate is about 14 percent, which mirrors the national numbers. The report finds there are some Indiana counties where more than half of the residents who are food insecure don’t qualify for SNAP or other nutrition programs. Weikert Bryant says parents and caregivers are having to make some tough choices when it comes to feeding their families. “Whether it’s buying cheap food or watering things down, which includes baby formula, all of these things come into play when a family is trying to get enough food on the table,” she points out. There are 11 food banks in Indiana that are part of the Feeding America program. Across the nation, Feeding America provides food assistance to 46 million people who are struggling with hunger. 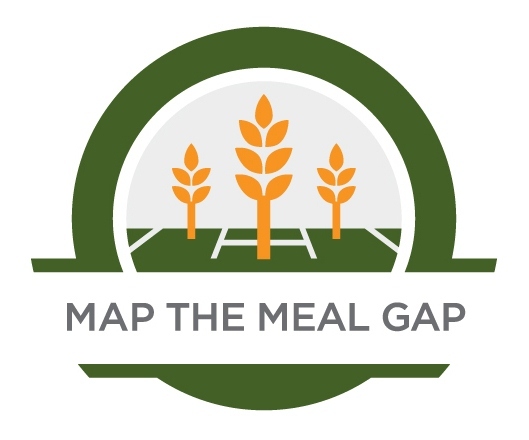 Indianapolis, Indiana – May 2, 2018 – Feeding Indiana’s Hungry announced the release of Map the Meal Gap 2018, the latest report by Feeding America® on food insecurity and the cost of food at both the county and congressional district level. 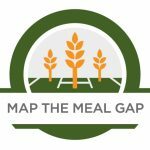 Map the Meal Gap 2018 reveals that food insecurity exists in every county in Indiana. Additionally, 31% of Indiana residents who are food insecure are likely ineligible for federal nutrition assistance under current program requirements just as Congress looks at further restricting eligibility for these programs through the Farm Bill. Overall food insecurity in Indiana ranges from a low of 8.8% of the population in Hamilton County up to 18.3% in Marion County. The statewide average food insecurity rate is 13.7%; the national average is 14%. The analysis also finds that in four Indiana counties roughly half of the people facing hunger are unable to participate in federal nutrition programs. In Hamilton County, 59% of people struggling with hunger may not qualify for food assistance. Hamilton County also has the lowest Child Food Insecurity rate of 11.8% but 62% of those 10,260 children do not qualify to participate in programs like free or reduced school meals. The eleven member food banks of Feeding Indiana’s Hungry are among the 200 food banks in the Feeding America network that collectively provides food assistance to 46 million Americans struggling with hunger. The study’s findings underscore the depth of need that remains in communities in Indiana and across the U.S., despite national measures from the USDA that indicate overall improvement. Food insecurity is a measure defined by the USDA as lack of access, at times, to enough food for an active, healthy life for all household members. This is the eighth consecutive year that Feeding America has conducted the Map the Meal Gap study. Emily Weikert Bryant is the Executive Director of Feeding Indiana’s Hungry. Over my years of working with Indiana’s farmers, I’ve had the opportunity to tell many of them what our food banks and pantries do to help Indiana’s hungry. To a one, every farmer has told me in response that they donate to their regional food bank through programs such as the Million Meals pork purchase program with Indiana Pork. They also work with their county Farm Bureau to supply food or funds to local organizations, provide nonperishable items for their church pantry or take extra produce from the garden to neighbors who need help. Hoosier farmers understand that they’re part of the collective agriculture community that is feeding the world – no exceptions. As the year progresses and Congress begins more discussion and debate on the farm bill, we look forward to continued collaboration with Indiana’s agriculture organizations and our Hoosier delegation in Congress for a strong farm bill for all involved to ensure that fewer and fewer Hoosiers go hungry.